There is a trail run – Taiwan Action Asia 50, which is one of Action Asia Events organized by the Action Asia Foundation, to be held in November 8, 2014 in the mountains near Shimen Reservoir in Taoyuan. The race route was planned by my friend Petr Novotný, he offered me the path kml file and some photos, I am very happy to make a dynamic Google Earth Tour, to support him! Taiwan Bluemagpie Tea is a brand that set by students and teacher of Institute of Building and Planning of National Taiwan University. Their team’s purpose is to help tea farmers living in Pinglin to sell their environmental-friendly tea without chemical fertilizer, pesticide and herbicide. They want to assist tea farmer through fair and reasonable price and making a lease, decreasing the risk of producing and selling for tea farmers. Their goal is to make Pinglin to be a eco-village, clean the water in reservoir, ensure the livelihood of tea farmers, inherit their artistry of making tea, and form a new generation of tea in the final. 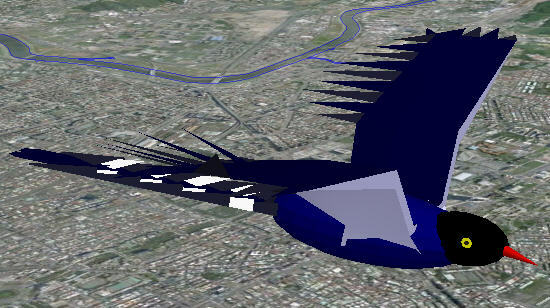 After Google discontinued support of the user generated 3D program last October, it’s in a frozon situation in Google Earth 3D layer, old model can not remove; new model can not append. If you want to show your models public, the only way you can do is put your models on your own server, display maybe slowly, but there is no way to do. I met the condition is how to deal with the model already exists? Turn off the 3D layer? This means that all the other buildings are gone, leaving only your own model to lonely self reward it? To show off the value of your own model, there must be surrounded by a lot of wonderful models. So I have to do other ways. 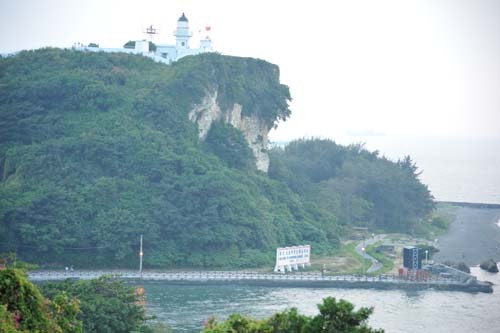 Qihou lighthouse is located in the Qihou hill at an altitude of 53 meters. Qihou hill is the highest point of the Qijin District, overlooking the Kaohsiung Harbor. But it is a very small mound in the current ground-based Google Earth , and the elevation is only 14 meters, it is clear that, as long as I made in accordance with the status of the whole hill terrain model, the current model will be coated inside the Qihou hill model, the problem can be solved. In this project, I went to the lighthouse to take pictures a few months ago. I had a chance to climb on top of the lighthouse. This vision is really great! Deserve a 360-degree panorama! I found a ring tower platform surrounded by 24 pieces railing fence. I put my elbows on railing fence every two intervals, and took a total 12 pictures. Finally, I stitched them into a 3-megapixel panorama Figure. Then I used the double window technology which is developed in “Mt. Everest Panorama in Google Earth“. The panorama picture is on top window. The bottom window except for 3D layers, I put the important landmarks and the loxodromes with the mark. Once you’re inside of it, drag the top image around to view any particular area, and the bottom image will stay in sync automatically. I make a kaohsiung 3D city tour, begin from Qihou lighthouse, fly over the entire downtown, hover each beautifully 3D building models, and finally back to the lighthouse. There are two different themes, one is panorama, the other is tour, but the same axle. So I put them in the same page, switch them with funtion key. 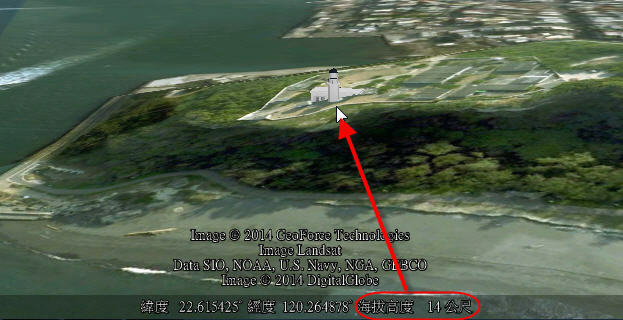 In the same time, I put the “kaohsiung 3d city tour kmz file” and “Qihou lighthouse panoramo kmz file ” on web page, you can download them. My friend – Chi Po-lin, is a photographer with more than 20 years experience from the air. He had long wanted to make a movie based on his photographs, but for years it seemed like a far-fetched dream.That changed in 2009, when French photographer Yann Arthus-Bertrand released his aerial documentary “Home” on climate change and global warming. Three years later,his “Beyond Beauty-Taiwan from Above” documentary has just won the Golden Horse Award for best documentary. More details you can read this story in the Wall Street Journal. Although most of us have not the opportunity to see “Taiwan from Above” as Chi, in order to allow everyone to experience Chi’s air task, I made the simulation with Google Earth. I used two windows – one in, one out. The GPS route I got from Chi, which made one day in 2008. This trip started from Puli , then flew to Central Mountains , Yushan Mountain, Sun Moon Lake and then back, It is a 240 km long, 1 hour 32 minute flight time records. 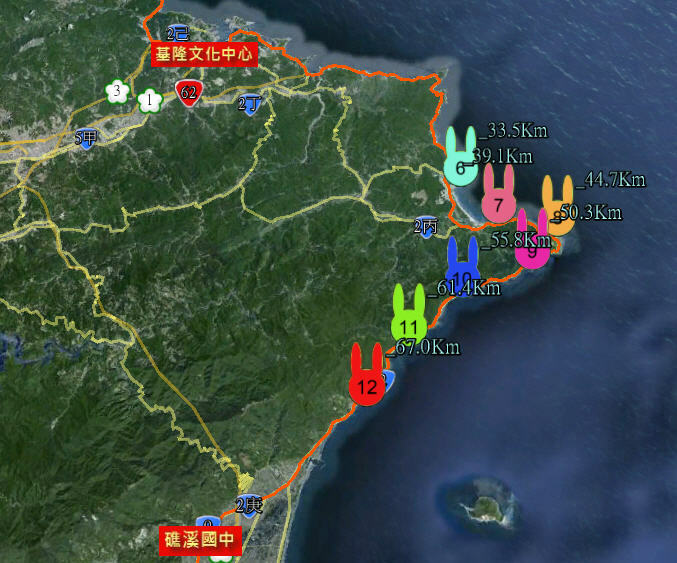 The biggest event of upcoming 2013 Taiwan marathon or known as International Tour de Taiwan Ultra-Marathon will start on the 30th of March. 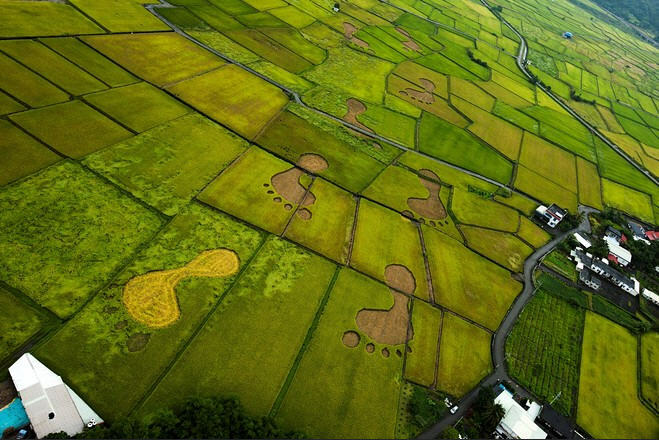 This foot race will be Taiwan’s first ever international marathon event. It also will be the longest distance (1100 km) and the longest period (14 days) road race event in Taiwan. How to use Google Earth to demonstrate the race is quite interesting to me. First of all, I easily created a navigation tour by using the function of dynamic flying to browse the entire journey. Then, I created a “Trial running Glance Tour” for each day of the race. Last, I complied those fifteen flying Glance Tour on the same page. It is then completed. But, there is something else I would like to do which is to add the runner’s instant position, especially in the events of this roundabout. There is something special about this event which is that every participants will be assigned a GPS cell phone from Leadtek. This way, we will be able to trace the runner’s live position through website. 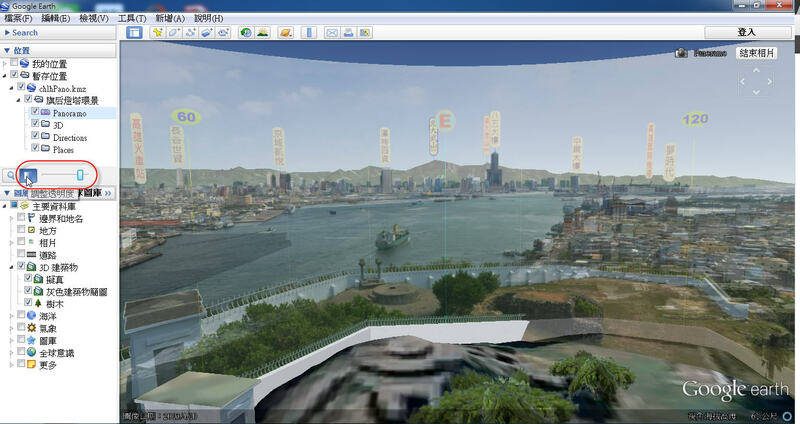 However, Leadtek is using 2D Google Map platform. I thought to myself, it will be wonderful if I can display those information on Google Earth. Therefore, I asked Leadtek to transfer GPS location to KML format. After few tried, I did not succeed. Although I was quite disappointed, I came up with another ideal which is to put “Rabbit” on the track. These “rabbits” is also known as “Marathon pace”. Like this long-range multi day race, most of the organizers will set a minimum threshold speed of six kilometer per hour along the road. The depots also serve as control station, withdraw the station once time is up. The runner who did not meet the threshold will lose the eligibility automatically (There is a rule at International Tour de Taiwan Ultra-Marathon which is “whoever did not complete accumulate three days within the time limit will be cancelled the qualification”). Therefore, I set up a rabbit per kilometer between the speed 6 – 12 kilometers. Seven rabbits were connected into a team. We can monitor the status of the entire tournament through the website. Meanwhile, it will put the static websites active in the game during two weeks time. If you open this 3D navigation web, the program will calculates the speed of each rabbit based on the system time. And instantly to know its current location. It will also calculate how long distance the rabbits has run. I set it up to update it once every 10 second. Therefore, each rabbits are moving dynamically. Incidentally, I also meet the design of the rabbit, change the page, click daily itinerary to itinerary map, then fly to the range closer, you can see the rabbit Road team mobile, the right of the “Flying Glance dynamic fly Glance Preview daily 3-5 minutes, I also add instant time for everyone’s convenience. This story talks about a hiking trip. I use Google Earth to record the all day long trip. At beginnig, there is a hiking plan. When you press “play” button, the tour start. The first stage is gathering. Several partners gather to Taipei from different places in the morning. The second stage is taking a bus to trailhead. 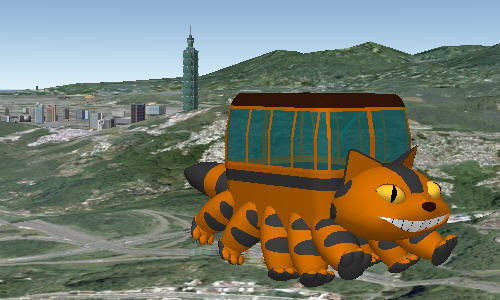 I use a totoro cat bus which I asked my friend Tantunny made it. Your can see the totoro bus change larger, go through tunnel, rotate, go along the road. The third stage is hiking to Songlo Lake. I use moving hikers icon , moving path, accompany with photos, and specially the sync altitude profile. The last stage is departing. I use a movie trailers to display all contribute and four music. Besides watching from youtube , you can also press this image below to take a trip in google earth.